Working as a data scientist in a large organization, how will that be? IT students received an answer to this question on April 10th. During this third edition of the Data Science Meet & Greet, at a.s.r. 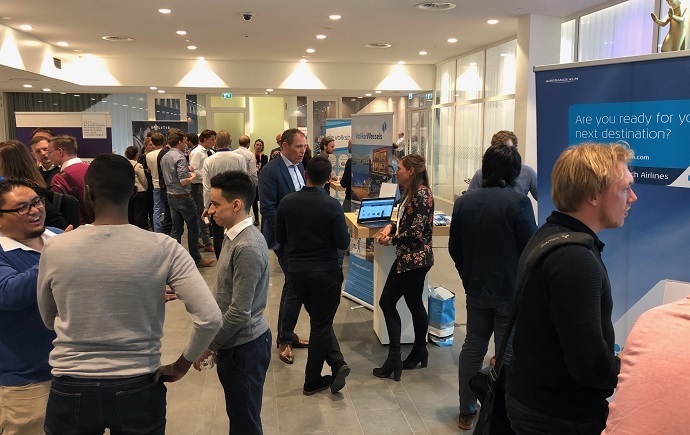 insurances, the CIO Platform Nederland again showed its connecting strength. Together with the host a.s.r., the CIO Platform Nederland has brought IT students and member organizations closer together. The Meet & Greet started for about 40 students with a warm welcome by Kees Tuijnman, CIO of a.s.r. Kees explained the students that a.s.r. does more than just insurances. The insurer promotes a healthier lifestyle with the help of data science and helps. Also a.s.r. helps people with a heavy job to keep working longer in a healthy way. Data is also an important factor in this subject. Data scientists from a.s.r., ONVZ, Volker Wessel, CBS, PostNL, Politie, KLM and the Volksbank showed this afternoon during 8 pitches the context of their work. Because what turns out, students don’t have a good idea about what they can expect when they get started as a data scientist. None of the students could give an answer to the question that was asked: "What does your first job look like?" Practical data science cases were presented to the students by the 8 participating companies. For example, how to predict the possible behaviour of people to switch to a competitor based on historical data. Or when equipment needs to be maintained. The students were warned that it costs a lot of time in preparing and cleaning up data before there you can do anything with it. Without clean data it is not possible to do validated predictions. What also became clear: as a data scientist you have a lot of freedom to start your own projects and work these out by yourself. This fact and contributing to a better society, was received very well by the students. In several pitches it became clear that asking questions, seeking help at peers and working together with the business are of great importance to be successful as a data scientist. It is impossible to control all the necessary competences by your own. Think of: IT skills, knowledge of IT-Infra, statistics, business expertise and knowledge and to manage competencies like teamwork, result driven, focus on the customer and a strong communicator. For organizations this is also important to keep in mind when compiling a data science team. Make sure all necessary qualities within the team are secured. 2. in which work environment can I learn this? “Working life is like a playground”, was said by Terry Nick. “Where you can experience freedom, fun and learning development.” The student will than come to a place that both the organization as the student can accelerate. Native English students for (PhD) internships! Also during this 3rd Data Science Meet & Greet more than 75% of the students was native English. An important signal was given by this group: it occurs they run into a wall while applying for an internship or PhD at Dutch companies because of the language barrier. Many large Dutch organizations can’t offer them a job, while there is a huge demand for IT/data science students. The CIO Platform Nederland calls all Dutch companies to be aware and anticipate that there are more and more native English students in the Netherlands. Create possibilities for these students to enter your company. Also pay extra attention to this group in your recruitment, make them feel welcome in your organization.